1873: "First Lutheran Church" across from West Primrose Cemetery Sec. 29 and 2nd Lutheran Church in Sec. 21 near East Primrose Cemetery. Pastors: Pastor I.A. Lavik 1950. Nicole Espe 2014. Notes: The Primrose Norwegian Evangelical Lutheran Church was organized by Rev. A. C. Preus and a church built on section 28, in 1866. In 1873, this was destroyed by fire but was rebuilt in 1874. 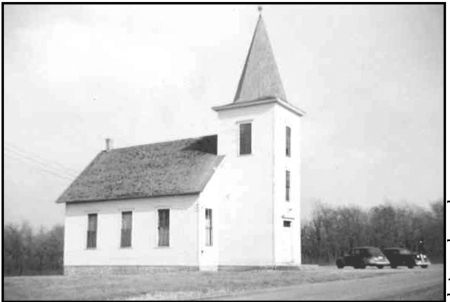 In 1915 it combined with the Primrose Hauge Lutheran Church forming the present Primrose Lutheran Church. The building is a combination using the bell tower from the Norwegian Evangelical Lutheran Church and the Hauge Church building. It was enlarged and moved to this location in 1941.